Rainfed: May-June to Sept- Oct.
Intercrop in tapioca : 40-50 kg kernels/ha. Plough the field 3-4 times into a fine tilth. Sow the seeds by dibbling in ploughed furrows at a spacing of 15 x 15cm. For seed treatment, the rhizobial culture is recommended. Irrigate the crop once in 7 days. Weed the crop 10-15 days after germination of seed by light hoeing. Give another light hoeing or raking at the time of application of the lime. Do not disturb the soil after 45 days of sowing. 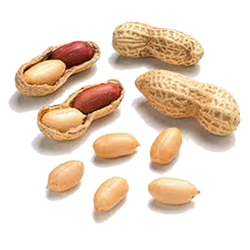 Red hairy caterpillar, termites and leaf miner are the major pests of groundnut.Against leaf miner apply any of the organo-phosphorous insecticides with contact action. Spraying carbaryl 0.15% controls red hairy caterpillars. Against ants/ earwigs/ termites damaging the pods, apply carbaryl 10% DP in the soil at the time of seeding. Tikka leaf spot disease infects both the rainfed and irrigated crops. Prophylactic spraying with Bordeaux mixture 1% before flowering will control the disease.